Electronically request and receive pathology direct to the patient record. Meddbase is setup with a fully integrated electronic pathology system that links directly with a number of labs such as HCA (Hospital Corporation of America) and TDL (The Doctors Lab). Request forms can be raised ad-hoc or during an appointment. If the appointment specifies tests, i.e. a WellMan health screen may include a profile blood test, the lab form will pre-populate with any tests required based on the service configuration. Extra tests can be ordered and added to the list via the Meddbase service picker. 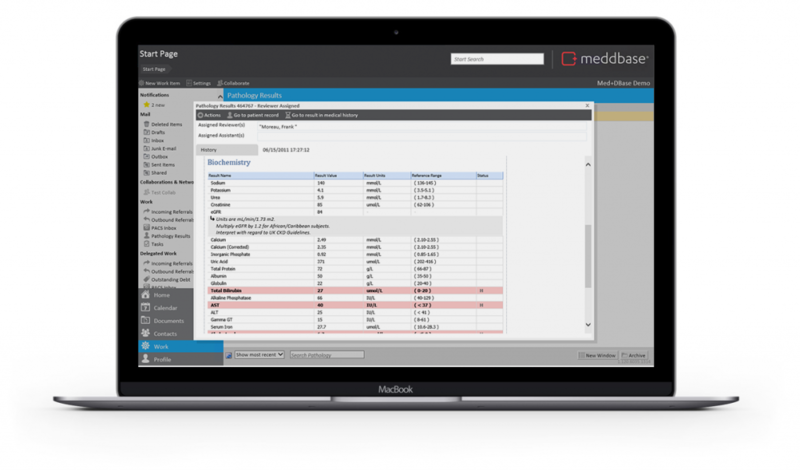 The Pathology Lab Request form is automatically created by the Meddbase software and contains all the patient information required, including a unique bar code that ensures complete accuracy when processing the tests. When tests are requested, the pathology lab automatically sends the results back to the central Meddbase servers. The test results directly update the patient medical record and a pathology work flow item can be triggered to inform the admin team or the requesting doctor.Email alerts can also be setup to send to the admin team and/or doctor notifing them that results have been received. The work flow item will allow the doctor to either action the result with a follow up or to re-assign. The Doctor can also assign a default assistant or team to deal with any follow ups needed as part of the work flow process. Pathology services are completely integrated with the Meddbase billing system. This allows you to setup test prices and specific tariffs, including list prices published by the lab, which can then be assigned to patient groups, employment companies or insurances companies. When a doctor requests a test, a billing item relating to the test or tests requested is added to the patient or company’s current invoice automatically thereby removing the possibility of requested tests not matching a supplier invoice or being allocated to an incorrect account.